In the winter of 1982, twelve men are commissioned by the United States National Science Foundation to gather data concerning the physical and natural sciences in the Antarctic. What they discover is an alien being that fell from the sky and lay buried in the ice for 100,000 years. Soon it would be freed and become one of them. John Carpenter's "The Thing," a contemporary thriller, tells of this American research expedition and what happens to them once the dormant "thing" is unleashed, creating havoc and death at the isolated base and threatening all of mankind. John Carpenter's "The Thing," A Turman-Foster Production, stars Kurt Russell. 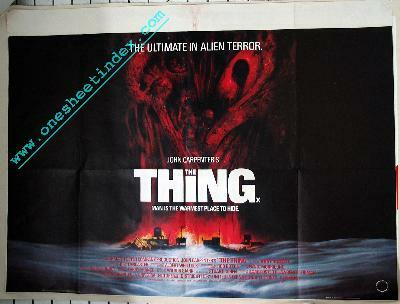 It was directed by John Carpenter from a screenplay by Bill Lancaster, based on the story "Who Goes There?" by John W. Campbell, Jr. (as Don A. Stuart). The Universal Release is produced by David Foster and Lawrence Turman, and co-produced by Stuart Cohen. Wilbur Stark is executive producer. stunned the literary world with his science-fiction thriller "Who Goes There?" ; this film follows the original storyline more closely than other adaptations. Based on the Story .................. "WHO GOES THERE?" Orig Story by ......................... JOHN W. CAMPBELL, JR.